If you want to race but don't know where to start, you're in the right place. You open your computer and see pictures of your friends high fiving at the finish line of a 5km and think "man, I wish I could do that". Well guess what? You can! How do I know? Experience. I didn't grow up an elite runner, I'm just an average person who has run every distance on any terrain because I wanted to, so I did. And so can you. I'm Hilary, and I believe anyone can run farther or faster than they thought possible with the right training. With over a decade of experience combined with multiple certifications, I'll teach you everything you need to toe the line with confidence! Train with Hilary. Hands down it is the best thing you can do for yourself. Previously, I did not think I was capable of doing a triathlon; I was not a strong swimmer. Yesterday, I received a silver medal in my category for my first sprint triathlon. I can’t wait to do more! Hilary is as inventive as she is intuitive in how she formulates training blocks. In addition to writing great run programming she understands the importance of good, run-specific cross training. Having not done much strength work prior to working with Hilary I was very unsure of how it would balance with a high mileage ultra training plan. That same strength work is what has enabled me to avoid dislocation resulting from my chronic ortho issues for six months, and has me confident that I will race my first season without dislocation in 2019. Racing is about more than the high of crossing a finish line. It's the experience of energy, the sense of accomplishment, the excitement, and the community. Rugged Conditioning is a race prep program that goes beyond a one size fits all training program. We look at your specific training needs and tailor each workout based on where you're at physically and what is going on in your life outside of training. Whether you want to cross the finish line of a sprint triathlon for the first time, or finish a 50km race in the trails, I can get you there. 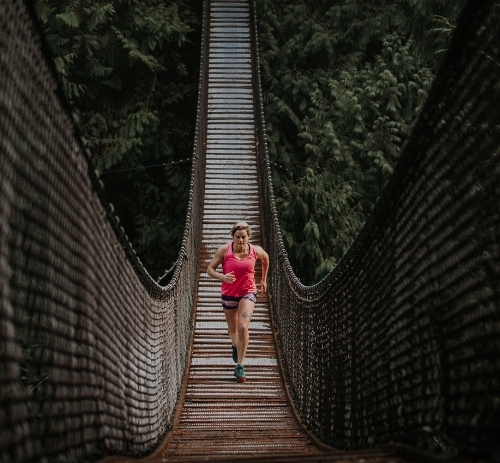 There’s more to running than staring at your watch and tracking speed, distance, and time. During our time together I want to go beyond telling you how far and how fast to run each day. I want to teach you how to understand your body, your training, your nutrition, and ultimately feel ready to train intuitively. Each day you’ll learn how your body is responding to the different types of workouts and how fast you can recover. As you gain experience, you’ll learn how to trust your body and know when to push distance or intensity, and when to pull back and rest. Ultimately, my goal is that one day you'll call me up and fire me. That you'll have the confidence all on your own to take off down the road or into the forest with no watch, and no plan. Sign up with your email address to receive health & fitness tips, workout ideas, and more. One on one coaching means you'll get a personalized training plan designed specifically for your goals. You’ll get unlimited communication so we can effectively adjust your plan to work with your fitness level, time commitments, and lifestyle. Oh, it’ll be fun too. You are ready to finally make a change but don’t really know where to start. Whether you’re looking to get faster in the offseason or totally new to the gym, we will tailor a program to get you exactly what you need. You’ll get all of the accountably and motivation that you can handle, plus we make sure your it fits your lifestyle.